My passion for writing pervades all aspect of my life. There are many publications by Kim Tasso. Much of my work doesn’t bear my name in the publications, web sites and blogs of my clients. But I have published a fair amount in my own name. This section describes the materials that I have had published in traditional media whereas the blogs section guides you through my on-line and more regularly updated content. The latter three books are available from Amazon. And I am immensely proud that the EG Books are also available in larger branches of Waterstone’s. 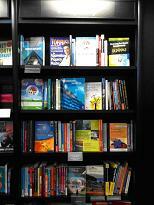 Second shelf down and towards the right – that’s my book in Waterstone’s in Piccadilly! I have written hundreds of articles for the property, legal, marketing and other media. They are listed in this section and there are keywords search for you to find the most relevant ones and I will happily send you across copies of those that you are interested in. Copyright issues prevent me from showing them all online – even though I wrote them! A White Paper on The use of Apps in the profession – lawyers, accountants and surveyors. A White Paper on The use of social media in relationship development in the professions. Two articles for Ark’s “Best Practices in Legal Marketing” – one on securing your seat at the strategy table and another on low budget marketing. The marketing and business development chapter of The Law Society’s Probate practitioner’s handbook. The sixth edition arrived in 2010. Marketing legal services to the grey market was published in October 2008 in Elderly Client Adviser magazine. You might also find the frequently asked questions a good source of introductory and guidance material and my main blog provides up to date comments and observations. Digital PR – What do you do if defamatory material about your business is published?